Uber is planning on bringing a new type of vehicle to your town, and this one doesn’t even have a driver. This weekend, it was revealed that the company is currently working on a concept for self-driving scooters, designed to get themselves to a suitable charging spot and out of harm’s way. Coming from a Twitter user who attended a robotics workshop, Uber revealed that it was hiring for its latest venture, which it’s dubbing “Micromobility”. However, with e-scooters receiving something of a chequered reception from those cities that they currently operate in, will autonomous scooters be welcomed? Uber itself hasn’t actually revealed very much about its plans. What we know so far originates from a single Tweet from the CEO of a company called 3D Robotics, Chris Anderson. This explains he was present at a robotics event where the company revealed its plans for “Micromobility Robotics”. According to Anderson, this term is being used by Uber to describe “Autonomous scooters and bikes that can drive themselves to charging or better locations”. He also stated that Uber was already hiring for experts to work on the project. The link shared on Twitter for the project points to a Google survey, where it seems those interested can register for more information. Anderson also stated that the initiative lives under Uber’s Jump brand, rather than UberATG (Advanced Technologies Group), which is responsible for its self-driving cars. Uber Jump is the company’s brand for bike and scooter rental. Available through the Uber app (assuming you live in one of the few locations it currently operates in), bikes and scooters are unlocked for $1, and then are yours to use for the cost of around 7 cents a minute (pricing varies depending on location). Before riders can scoot off into the sunset, they need to upload a picture of their driving license, to prove that they have one, and also that they over 18 (the bikes and scooters are unavailable to minors). When you’ve finished your journey, you select ‘end ride’ on the app and take a photo of the bike/scooter, to prove you’ve left it in a decent condition for the next person. Interestingly, unlike some other companies such as Bird and Spin, Uber collects, charges and distributes its bikes itself, rather than relying on third parties. Why Do Scooters Need to be Autonomous? Unlike self-driving cars, it appears that scooters are being designed to navigate independently for their own sake, rather than with passengers on board. 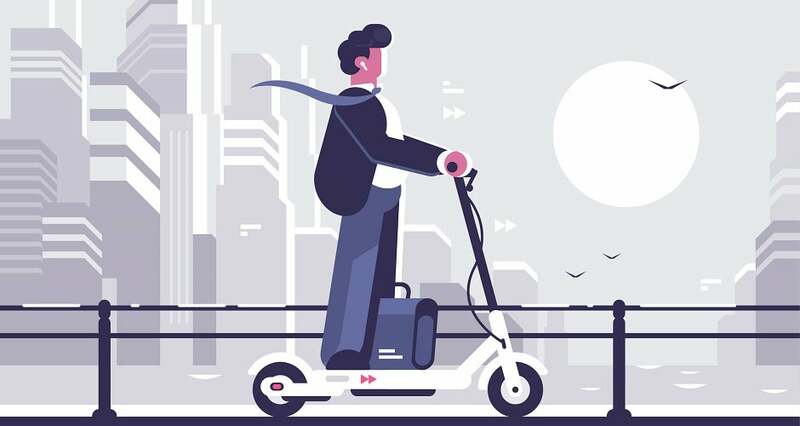 The concept is that once the passenger has arrived at their journey, the scooter will make its way to the nearest charging dock to self-charge and secure in place. This is important to the scooter companies for two reasons. Firstly, scooters left undocked by users are more susceptible to being stolen or vandalised. Also, e-scooter companies currently pay people to gather up scooters at the end of the day and deliver them back to charging points, or charge them themselves. This costs the companies money (and has also been the cause of turf wars, with collectors fighting over discarded scooters). In theory, automated scooters should mean that fewer go missing, and that the cities sidewalks are a lot less cluttered, keeping local authorities happy. In light of the news, some have argued on Twitter that removing the need to collect the scooters manually is removing jobs from the local community. Are Self-Driving Scooters a Good Idea? Scooter hire is big business – or at least, it could be. There are plenty of companies currently getting in on the ground floor in the hope that it will take off in a big way. Companies such as Bird, Lyft, Spin and LimeFree are investing a lot of money in their scooters, distributing them in huge numbers in large cities to attract riders. The rise of the powered scooter hasn’t been a smooth one, though. Some cities, such as San Francisco, have actually temporarily banned them in the past, citing concern over permits and public safety. Not everyone is a fan. There are numerous videos and photos online of citizens gleefully destroying these scooters. With 75,000 followers, Bird Grave Yard on Instagram is a fairly typical example. Watch the videos and you’ll see that the scooter destroyers aren’t just bored teens (although to be fair, some definitely are), but men and women of all ages and backgrounds who have simply had enough of the scooters in their neighborhood. One video even shows a Rabbi tossing a scooter from the sidewalk. Then there’s the small issue of self-driving vehicles causing accidents. Whether they’re running into people, cars, or even robots, it’s an issue which could well be compounded with thousands of self-aware scooters zipping across busy cities.